Well not too much to say about the weather really...its wet....with capital WET!!! The weather turned last Thursday evening with horrific thunderstorms rolling in and although we had a bit of a lull on Saturday and I managed to get the shed roof re-felted with the help of my Hubby that is about it..there has been the odd 'bright' spell but nothing to celebrate really. Only consolation is that it's still quite warm and although we are about to enter October I still haven;t used my heating!! The storm rolling in from the south west last Thursday evening. As for the week long silence....a really bad cold....or flu to all my male readers...(at least I still have a sense of humour!) Work had carried on and I have kept up with all the menial chores but this is the first time I have sat down to the computer in a week...hoping the worst is over now and that a relaxing weekend will cure me completely. Will post again in a couple of days...here's hoping that some of you are having better weather than what I am!! 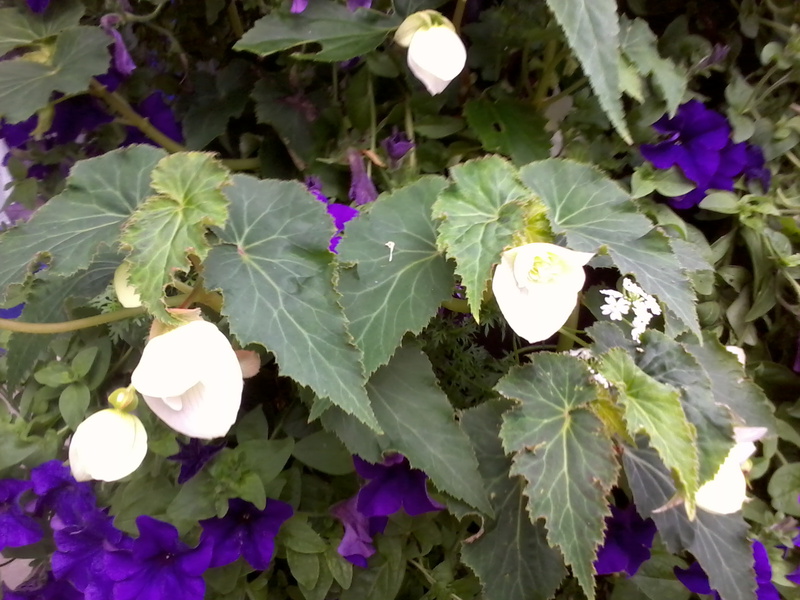 On an entirely different note I was wondering if anyone could name this flower...I just found the picture on my phone...to be honest I had forgotten all about it but these flowers were in some displays in the center of my town and I thought they were really pretty and wanted to grow some...but I have no idea what they are...please help!! The mysterious flower...I hope someone can identify it for me. Looking at my archives I think I must have numbered last weeks weather watch wrong so I have skipped one to bring the weeks numbers right again...not that I know for definite that I have the numbers right but I guess I will find out at the end of the year!! Well it's been a pleasant week with the temperatures slowly increasing to give us a little Indian Summer...according to the met office this isn't going to last past the weekend but I will take all I can get!! No rain...quite breezy and a lovely warm sun has had me up the allotment and out in the garden tidying up...today it was 22 degrees and I am hoping that the rain manages to hold off for a few more days yet so I can get my garden finished and looking nice this week. Hope the weather has been as kind to you wherever you may be!! Well today has been a great day...nothing special has happened really but it's been really nice. I had intended to get some of my main crop potatoes dug up today and when I awoke this morning it was to clear skies and sunshine which lifted my heart as I knew my plans could be carried out as for once the weather was cooperating!! 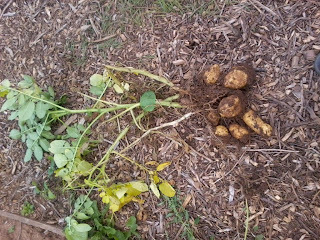 Above left is the full yield of potatoes I had from 24 plants..these are King Edwards and right is the ground freshly dug over and weeded!! The day was quite chilly but it didn't dampen my spirits and the children wanted to come and help on the plot too which made me smile as I hadn't told them about Dave's ducklings and I knew they were going to love them!! We took a picnic, flasks and plenty of drink with us and had a lovely day digging, weeding, bug catching the toads dinner and playing with the ducklings. Dave joined us for our picnic and then again about 3:3opm when I went home to replenish the flasks with hot chocolate. Introducing Dave...not the best picture but he is a little camera shy!! We were down the allotment for about 6 hours, even my Hubby popped down to see us for a while which topped the day off nicely and made it totally, complete before we went home happily tired and ready for tea...see nothing special really but just one of those wonderful days!! Oh and just before I go I would like to thanks Soilman For the tips and video from his blog about harvesting main crop potatoes...it was a great help!! Nice surprises due to good neighbours!! So I asked a fellow allotment holder (Dave) if when he was next in town he could pick me up some fence posts ( I felt that I could ask Dave as we are both original villagers and grew up together as did our parents and grandparents...yep our families really are original village folk!) so that I could put a permanent fence just behind my bean fence for the grape vines to climb up and so that there would be a definite divide between mine and my neighbours half plot. My new fence waiting for the grapevines!! Well when I went down the plot yesterday not only had Dave picked me up some fence posts but he had also erected me a wonderful fence complete with wiring....I guess nice people and chivalry really do still exist!! Anyway I got to work today and got the grapevines moved to their new home. They looked a little sad and withered after the move but I'm sure it won't be long before they are well settled in and picking themselves up again. I also put some metal posts in at the top end of the plot today on the rise and have pulled some stray brambles that were growing round there round the wire..there are more growing there and as they get longer I am going to train these round the wire to so I have a lovely bramble patch at the top end of the plot. I also found a couple of self sown sloe trees which I relocated up here too. To top the day off I finally cut open the melon I brought home the other day...it was quite small but we all had a bit and the taste was wonderful...not too strong, not too sweet and lovely and tender. Melons are definitely on the growing menu again for next year!! My melon, sliced and ready to be eaten! Well the weather has been changeable at best this week. It has been dry,drizzly and torrential rain as well as still, breezy, gusty and blustery. This usually all occurred in the same day...pretty much every day too. The temperature hasn't been too bad though mostly in the high teens and feeling quite pleasant even with the wind and rain. Today is the first 'chilly' morning we've had and even that didn't require more than a light jacket. As of yet I haven't thought to put any heating on and hope I still don't have to for a while. It will be interesting next year to look back on these and see what similarities there are. Haven't manged to get to the plot yet this week but hoping to on Friday and over the weekend....I did see a fellow allotment-er today who said I can have some more tomatoes so I think I will make some tomato sauce with the next lot!! Well it's been a very busy day today with kids, work, shopping and cooking but finally I can now sit down and relax...well after this post that is!! My courgettes as every have done well this year and are still fruiting and I was given a big bag of various tomatoes from an allotment neighbour so I decided to make some pasta sauce today as I have plenty of tomatoes from my own plants but wasn't going to pass up a freebie!! The Rhubarb I bought from the garden center has been planted in the raised bed at the top end of the plot...as it spreads the strawberries can be moved and it will be nicely contained here. It was a very lazy sauce where I just halved the tomatoes and then chucked them all in a pan and once they had cooked down I rubbed them through a colander to remover the skins but keep all the pulp. I then added some salt pepper and basil and let it bubble up for a while...that was it, job done!! A nice easy fresh sauce which I put into jars. I had one very huge jar so I diced up a courgette stuffed the large jar full of it and then poured sauce into that as well. I didn't cook the courgette first as I want it to be quite firm when I use it to make a vegetable and pasta bake and as the sauce was boiling when I poured it in I figured that would be enough. My new Blueberry bush planted in its pot. I also was given a large bag of eating apples from my Mum's neighbours...there were too many to eat so some I peeled and cored and then boiled them quick in water and lime juice...left to cool and then bagged and froze them for deserts later on....they were red blush apple similar to Elspan but my Mum's neighbor didn't know exactly what type they were but the smell and taste is delicious!! The two white currant bushes placed between the red and black currants. I popped up to the allotment to water the greenhouse and when I opened the door was greeted by the wonderful aroma of melon...yep, one had ripened and split slightly so I have brought it home...it's not very big and we haven't cut it yet but I will give you the verdict when I do!! I have to say I am quite excited about the fact! My Melon...I put the camera case next to it to give you an idea of the size. I don't know if it should have grown bigger or if they were a miniature variety...I guess I should have paid more attention to the packet!! That's really all for now....hoping to get a bit of work done on the plot tomorrow if the weather stays fine for me. 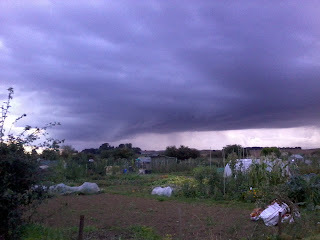 Well not much has been going on down the allotment...( as in I have been lazy and not been there much!) But I did take a quick trip to the garden center on Friday evening with Kate and I bought two white currant bushes, another blueberry bush and some Rhubarb. I also got a fancy seed distributor thing which I'm hoping will make life a little easier next year when sowing seeds. I originally went to get some Loganberries but they didn't look very good and when I though about it I figured I could mix my own raspberries and blackberries to make loganberries in a pot so not too much was lost there. I did pop down the allotment last night to get them in the ground and to also pick some runner-beans, carrots, leek and cabbage for dinner today. I still have potatoes in the cupboard so didn't have to dig any for dinner!! I did have plans to get some weeding done yesterday but that never happened purely through me fancying having a lazy day at home with the children which I thoroughly enjoyed and we all deserved after a first week back and school and work. Might get something done today though as the sun is shining nicely. Hope you're all enjoying your weekend too!! Weather watch Wednesday...week 36 2010 and some more spuds!! Well surprisingly after the forecast we were given the weather has been quite good to us over the last week. We have had some rain but it has been in the evenings and I was grateful for this as it watered my new plants in nicely and helped them get established. Although we haven't had a whole lot of sun and at times the wind has been strong the days have generally been warm in the late teens and occasionally scraping the 20's...if this keeps up for September I will be happy!! Now for the potatoes...I am still digging my second early new potatoes and although they are quite big they scrape well, cook nicely and taste delicious. I have dug quite a few now and all of them have been healthy and there are a good number of potatoes to each plant. Haven't been down the plot much this week...kids starting back at school and college and work re-commencing has put a spanner in the works until I get back into the swing of things...Hoping to get a day down there at the weekend though!! 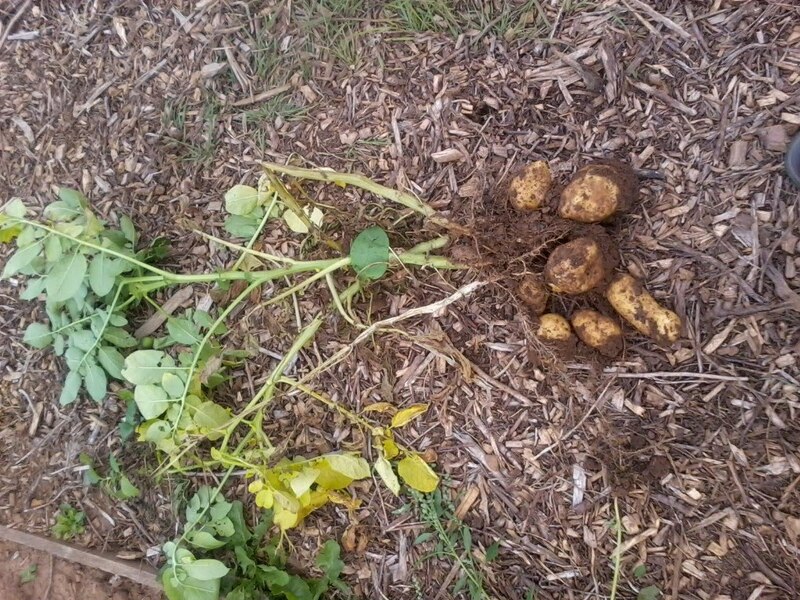 My second crop of 'early' potatoes....Charlotte. Winter veg plug plant hunt. Well as I said yesterday I went out this morning on a hunt for winter veg plants. It's been quite a productive day all round really. I got my bike out early this morning and went into town and managed to get 7 trays of various varieties of cabbage, sprouting broccoli, cauliflower and lettuce......then Dave another plot owner also gave me some curly kale plug plants. I got back from town and took the plants up the allotment then came home, did lunch for the kids and got the ironing done and finished off my third teddy bear. I then biked down to the chippy to get tea ( that's right people...the chippy, Saturdays are my day off cooking!). 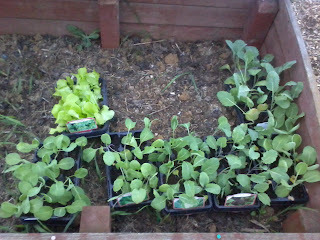 Got home and after eating and letting my tea settle I headed up the allotment to get the plug plants in the ground. I got 74 planted out which I was very pleased with and the plot is now looking like it is supposed to again but I didn't get a photo of the finished lot as it was dark by the time I got home. What I don't get is, on my seed packets it tells me to sow such seeds in like March/April time and then plant out in June/July time....if this is the case why can you but them now for planting out??? I think I am going to be a little more careful about when I sow things from now on and I am definitely going to be looking for succession sowing plants to give me longer crops...I hate the thought of there being no veg in the ground that I can go and pics and with having more land now I have been thinking of what I can sow more of next year when I will have all my land ready. These are the plants I got off the market..£2.00 a tray which is more expensive than growing your own but better than nothing. There are 12 plants in each one and they are all very strong and healthy so for this year I will be happy with it!! So do you all have your winter veg plants yet?? What are you planning to grow??? Is there anything I haven't mentioned which I could think about growing for next winter?? Two weeks past...allotment, foraging, cooking....was it worth the wait?!?!?! Well I promised you a decent post and so I hope this will suffice. I have to admit it is going to be mostly a picture post as I did have my camera handy quite a bit so I will show you as well as tell you what has been keeping me so busy these last couple of weeks!! First off my Mum has a lovely mature Victoria Plum tree in her garden and i had some last year to make some jam. This year I decided to make some plum Jelly as I much prefer this to jam and it also meant I didn't have to spend hours stoning the plums!! I also made a whole host of crumbles in various varieties...of course for this you have to stone them...that's where I enlisted a little help!! The plums being stoned for the crumbles, we made plum, plum and cinnamon, apple and blackberry, blackberry, plum and blackberry. In all we made about 20 crumbles some went straight into the freezer! In total I made6 jars of Plum jelly and it smelt delicious cooking...really must remember to clean the labels off the jars properly before I decide to sterilize them! I also took the Kids and my Mum Blackberry picking, they are very late this year but extremely juicy and we got plenty to make crumbles and jellies as again this is my preferred option. The blackberries bubbling away nicely in preparation for draining, then the jelly making began! !.Problem was it didn't set as you will all know from my previous post. Well I have since emptied everything back into the pan, re-sterilized the jars and re-boiled....I started with 7 pots and now have 5 cooling on the kitchen window sill...hope it does the trick...If not I think I will go with 'sharkbytes' idea of wonderful syrup and pretend that was my intention anyway!! I also finally got some tomato soup made, I made up a plain one and a hot garlic one. They turned out great and very tangy, I think I could have actually added some more vegetable stock but as i took ideas from people on there and then threw in some of my own it was very much experimentation so I was quite pleased with my first batch. The bag it is stored in is great, you can pour the hot soup straight into them then when it has cooled seal and freeze them...when you want your soup you can do ti in the microwave in the bag and then use the bag again!! I filled three bags with soup! And this is my sweetcorn...the first I have ever grown and picked..it tasted wonderful...so juicy and sweet and it went down a treat with the kids...i will definitely grow more next year! I really thought I had taken more photo's than that but I guess not, I have also been busy down the allotment getting plenty of weeding done, taking out failed crops (all of which were brassicas!) and digging over the land and manuring it ready for the winter. I always like to do a rough dig where I am not going to plant for the winter as this lets the frosts get in and kill any nasty bugs in the land. I have started digging my Charlotte potatoes and they have a lovely flavour and even though they are quite large they scrape well. I haven't tried my main crop spuds yet. We had a barbecue today so I picked some more corn and wrapped it in foil with a know of butter and pout it on the barbecue...it was really nice cooked this way and the couple that didn't get eaten I have frozen for another day. My beetroot is beginning to look like turnips but still tastes wonderful and isn't at all tough! Tomorrow morning I am off to the market to see if I can get some plug plants for winter...I know I'm a little late doing this but with the sudden warm spell I figure I have time to get these in as it is said to hold out for a few more weeks yet. Well that's things about up to date for now. Just want to thank you all for your help with the bramble jelly dilemma, I will try and get some pics of the plot tomorrow so you can really see how things are coming on. Hope the weather is being as kind to you as it is to me! !